I'm the first to admit that I have a rather plum setting in which to learn the art of being a priest. Our daily Eucharist takes place at 11:00 am, which leaves me ample time to read and pray prior to Mass. The ribbons of the sacramentary no longer seem as daunting as they once did and I'm increasingly confident in my ability to recite portions of the Eucharistic prayers from memory. Naturally, though, there's a catch. I've never been a hyper-coordinated person. This is probably why I like the accordion: it doesn't require an enormous amount of coordinated exertion. One simply establishes oneself in a chair, or a bar stool, or stands just behind a microphone and plays tunes. Not a whole lot of movement. 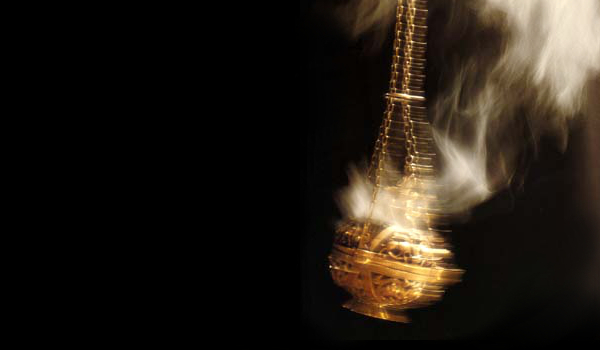 Acknowledging my limitations, I set out last week to practice using the thurible or censer. Knowing that I'll eventually need to use incense, I seized an opportunity to practice a few days ago. I placed the charcoal in the bottom of the thurible, sampled a variety of incense I found in the sacristy, I practiced various maneuvers. I got the hang of the basic "swing" from side to side. I practiced incensing objects - the Book of the Gospels, other people - and found that to be easy enough. Eventually I got it so that I could "clink" the chain against the thurible, producing a rather nice sound effect to accompany the billows of smoke. Naturally, I tried to effect a synthesis of my skills: could I incense the altar and the gifts? Three times I practiced it and did it pretty well each time. Slow procession around the alter, the thurible swinging in a stable arc. Bow before the altar and incense it. Resume the slow journey around the altar. I couldn't leave it at three. On my fourth attempt, I must have given too much slack to the chain and, when I went to incense the altar, you guessed it: the thurible clipped the edge of the altar on the upswing and red-hot charcoal and incense spilled out on to the altar. Fortunately for our historic church, I did not burn the building down. I did, however, do quite a number on the altar cloth. This is not the best depiction of the damage I wrought, but it gives you a sense of what hot coals cast upon linen can do. So, I'll probably have to serve as an indentured servant around here in order to pay off the cost of a new altar cloth. Otherwise, things are going well. 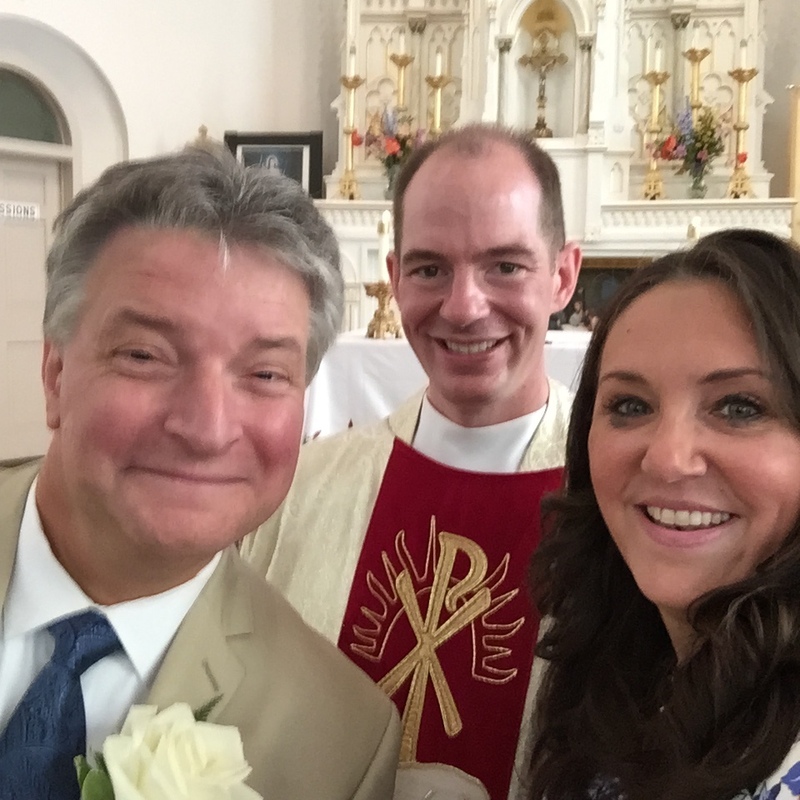 I continue to be really busy with weddings and a host of Masses. This upcoming weekend I have two wedding rehearsals, two weddings, four vow renewals, and three if not four weekend Masses. One of the nice parts of being a priest serving on a prime vacation spot is that you run into loads of people you know. Indeed, we've had a pretty steady stream of visitors and there's only been a few nights that just two of us are in the house. This weekend, though, I'll be here alone...although the liturgical and social duties of the weekend will certainly keep me busy. One final thing: one of really brilliant elements of serving on Mackinac Island is that you get to interact with a wide array of people. Of course, there is no shortage of people shambling through the streets in search of their next fix of Mackinac Island Fudge. Nor is there a shortage of people who think nothing of walking through pools of standing water...when it hasn't rained here in days and horses do relieve themselves in the streets. But in addition to meeting tourists and seeing old friends who happen to be passing through, it's amazing to serve the workers who labor behind the scenes. Drawn from Eastern Europe, Jamaica, the Philippines, and Mexico, it's a privilege to get to know many of the workers who go unseen each day. 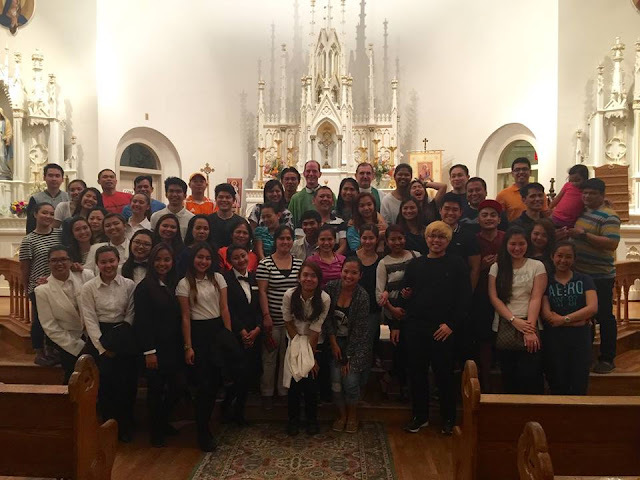 Indeed, just the other night it was a joy to celebrate mass with the Filipino community and to join them for an amazing mean after. It's one thing to go to a church each Sunday where everybody looks the same. That happens here, too, at the regular Sunday Masses: these workers are often working during the hours worship services are available. Thus we have to schedule creatively in order to accommodate their schedules, sometimes even pushing Mass back until after nine o'clock in the evening. The good spirit of the people and their joy at having their spiritual and physical hunger sated, however, make the long days worth it (at least from my end).